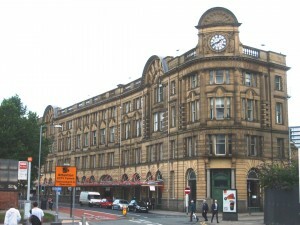 Manchester Victoria is the 2nd busiest railway station in Greater Manchester after Manchester Piccadilly. Victoria’s current usage level is approximately 7 million passengers per year. It is served by trains to the north, west and east of Manchester. The station originated in 1844 and was the first station in the UK using the name Victoria (by permission of the then Queen). Over the years the station grew in size to have a maximum of 17 platforms – it currently has 6 (excluding those used by Metrolink). 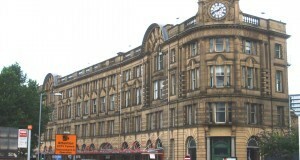 The current main station frontage buildings date from 1909 and feature some notable historic elements from the period of the Lancashire & Yorkshire Railway. These include a large tile map of the Lancashire & Yorkshire Railway, War Memorial, external canopies showing destinations served from the station by the Lancashire & Yorkshire Railway, and traditional ticket office. Much of the station was damaged by aerial bombardment in the 2nd World War and the roof and some other areas of the station were damaged by the 1996 IRA bombing. SJ 839 990 – for a map visit www.streetmap.co.uk and enter the grid reference. Staffed Station (platform staff 24 hours, booking office open Monday to Saturdays 0630 – 2200, and Sundays 0800 – 2215, providing national rail information and tickets and other public transport information). Accessibility and Mobility Access: There is step-free access to all areas of the station – lifts are available. Outside the station and nearby on Corporation Street, bus links are available both within and out of the city centre. These include the FREE Metroshuttle Route 2 which links to Deansgate, Oxford Road, Spinningfields, and many other shopping and entertainment locations. Click here for bus timetables. Victoria station is also an interchange for the Metrolink tram system. Click here for Metrolink timetables and route information. The station is linked to the Manchester Evening News Arena, providing an easy means of transport to and from events that are held there. Just outside the station is the Urbis centre, which is the home of the National Football Museum. Click here for more detail. The station is within easy walking distance of the main city centre areas and attractions. Shop till you drop in the Arndale Centre, the Triangle complex, the designer boutiques around King Street, or the independent shops found in the Northern Quarter. Visit Manchester Cathedral, which dates back to Saxon times (click here for more detail), Manchester’s Victorian Town Hall (click here), or Manchester Art Gallery (click here). You can also marvel at the modern architecture including the Beetham Tower, which was completed in 2006 at a cost of £150 million. It is the highest building in Manchester, the tallest residential building in Europe and the 7th tallest building in England. Click here for more detail. Manchester is home to some of the North West’s finest restaurants, theatres, bars and nightclubs. Why not spend a weekend break is this fabulous city? For more information on all there is to see and do in Manchester, please click here.